Objective overview of your company’s reputation on social networks and forums. Do not rely on inaccurate and misleading automatized tools for social network monitoring. The market is flooded with these tools. The relevance of the coverage often does not reach even 5% of automatically generated and evaluated content. 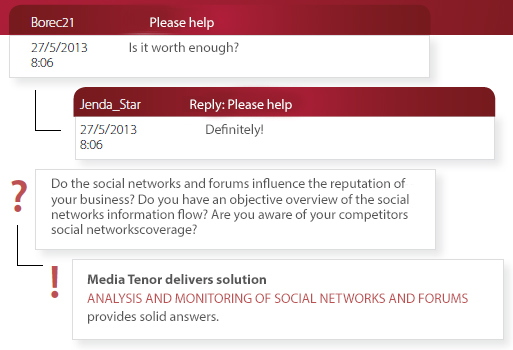 Therefore Media Tenor offers an product which analyse and monitore combining both, technology and an expert analyst assessment of the actual content. What is the intensity of coverage of your brand/event/report/topic within social media? How do the social networks users accept your brand/event/report/topic? How intensively social media mention various product lines of each brands? How are these product lines accepted? Which social platforms inform on monitored brands/events/cases/topics at the most? Which social platforms report on brands/events/ cases/topics positively, which negatively? What are the specifics of the coverage of industry/brands/events/cases/topics across the social media platforms? Who are the most active debaters and what is their engagement and ambassadorship do the brand/event/reports/topics? Is there a suspicion on „paid debaters“?